Marines shifting bases in Nawa to Afghan control, but what's next? You are at:Home»Afghanistan»Marines shifting bases in Nawa to Afghan control, but what's next? 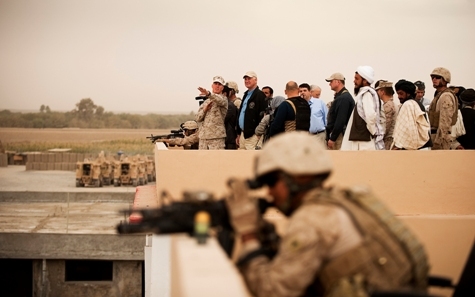 For months, Marine leaders in Afghanistan have cited the district of Nawa as an example of what the Marine Corps can accomplish in Helmand province. Home to about 80,000 people along the Helmand River, it has improving security and a stability that is still sorely lacking in other districts. Now, with the traditional Afghan fighting season coming to a close, the Corps is beginning to transfer bases in Nawa to Afghan control, the Washington Post’s Rajiv Chandrasekaran reported yesterday. It’s the first district in Helmand in which it has been possible since a buildup of forces began last December. The move raises some interesting questions. For one, if Nawa is improved, will there be pressure in Washington for the Corps to reduce its forces in southern Afghanistan? There are still plenty of other areas that presumably could use additional forces, considering the continued attacks that Marines face in Marjah, Sangin and other violent districts. Second, how much help will Afghan forces in Nawa need? Marines with 3rd Battalion, 3rd Marines, out of Marine Corps Base Hawaii, will remain nearby to serve as the cavalry and as advisers. It’s the Afghans who need to prove they can protect their own turf, though. Last week, Brig. Gen. Joseph Osterman, commander of 1st Marine Division (Forward), said he viewed Nawa as a “mature” district, but that Marine leadership didn’t want to rush the transition. “We’re not in a hurry at this point to — you know, diminish the security forces there,” he said, speaking to reporters at the Pentagon from Afghanistan. “We have been more and more increasing the viability of the Afghan forces within Nawa, in particular. The situation is worth monitoring, especially early in 2011. Yeah, lets train the Afghan people so they can kill our Marines. Good idea Obama! fabulosa osurga de ncias y cestri con paramenio peliagut. sedinstam a aspertas y cionarios eutico con timer agias!